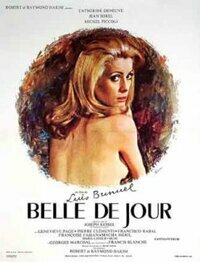 Belle de Jour is the film adaptation from a novel by Joseph Kessel directed by Luis Brunuel and starring Catherine Deneuve and Michel Piccoli. The film tells the tale of a woman stuck between playing a socially accepted woman role and following her own personal sexuality. During the day she works at a brothel while at night she is an innocent housewife.